Day 2 of the Warhammer 40K Grand Tournament quickly got underway following a ridiculously late night in Nottingham's Rock City followed by another fine full english breakfast and a double Espresso to wake me up! We walked to Warhammer World again, only to find that we had arrived a little late and had but moments to set up our armies, introduce ourselves to our opponents and start playing. I found myself playing on the middle tables (usually where I'm happiest) and saw on listings that I was playing a chap called Shaun and his Ork army. But when I arrived, I found that he had brought Tyranids instead. LOTS of Tyranids. Fortunately there was a lack of cover on the board, so my wealth of Strength 5, AP5 weapons should cause a bit dent in his swarm. I also noted a lack of long ranged fire power, which meant that my Tau tanks could be relatively safe. I won the roll off and let Shaun choose his table quarter, set up first and go first. While I could have focussed on pouring as much fire power into him as possible in the first turn, I knew that clever deployment and use of reserves would be my friend in this mission. He declared that his Broodlord and retinue would be in reserve, outflanking while the rest of his army set up within 12" of the centre, as far forward as possible. My first priority would be to get rid of his high strength guns as these would be a threat to my tanks. After that, I'd fall back on my usual run and gun tactics with flechette dischargers on the tanks to inflict some extra damage for when he inevitably charged me. So I set up the Broadsides, Hammerhead and Tau Battlesuit command team behind it (all just outside of 12" from the right board edge to avoid the Brood Lord and chums). The Tyranid horde surged forward as one. Some shots were fired, they didn't do anything. The Broadsides fired into the Tyranid Warriors to the left of the central building, killing one of them. Damn synapse rule! I'd forgotten about that. The Battlesuit Command team jumped into the ruins, following behind the Hammerhead. The Tau Commander injured himself on the rocks (tsk!) and the squad opened fire on the advancing Dakka-Fex, inflicting only 2 wounds. The Hammerhead aimed its railgun at the monstrous creature...and missed. Not a great start! The Brood Lord and his Genestealer retinue arrived. Shaun rolled a 6, so he could choose where 'Broody' and chums would arrive. He brought them on right behind the Tau Battlesuit command team and ran them to make sure the Battlesuits wouldn't be able to escape next turn. The Tyranid army continued its advance. It had quickly become apparent just how much the swarm had been slowed by having to spread out in such a tiny deployment zone. With squads of creatures pushed to the back, the army had been dispersed into lots of little waves rather than a single wave that could crush my small Tau army. The Dakka Fex opened fire on the Tau Battlesuit command team, inflicting a wound on one of the Commander's bodyguards and killing both shield drones. The squad held their ground thankfully. The Tau phase began with 3 Devilfish transports arriving from reserve. With only one Outflanking unit to take care of, the Battlesuits, Broadsides and Hammerhead could fall back safely towards the table corner. Safe from the majority of the Tyranid's guns, 2 Devilfish moves 6" on and their Firewarrior passengers disembarked, taking aim at the Brood Lord and its retinue. Once the smoke cleared only the Brood Lord remained. I had hoped to kill him as well. Then I could focus the plasma rifles and missile pods of my Battlesuits at the approaching Dakka-Fex. The Hammerhead took aim with its railgun and missed -again! It was up to the Battlesuits who gunned down the Broodlord with no effort and jumped back behind the safety of the Hammerhead. Try and shoot me now Mr Dakka-Fex! The Broadsides continued to fire at the Tyranid Warriors, wounding another (they had nothing else to shoot at). Meanwhile on the left flank, the third Devilfish arrived and also began firing at the Tyranid Warriors from a safe distance. Then plan was to shoot at the tail of the swarm as it charged towards my main force on the right. The Tyranid swarm continued to advance, ignoring the Devilfish on the left. The Hive Tyrant's venom cannon was out of range. The Dakka-Fex devourers were just out of range of the Tau Firewarriors it tried to get a bead on. Meanwhile the Tyranid warriors and Genestealers continued to surge forward. Next turn the Hammerhead would get charged and there was nothing I could do about it. The Tau Battlesuits with twin linked flamers and single missile pods arrived from reserve and jumped behind the Devilfish on the left flank. The Skyray also arrived, taking up position on the left flank where all three units could continue to fire at the Tyranid Warriors -I want that Kill Point! But 2 of them remained. The Tau Battlesuit command team finished off the Dakka-Fex while the Firewarriors embarked in their Devilfish transports advanced along the right flank, staying away from the swarm, firing their smart missiles at the Tyranid Warriors on the right of the building. The Hammerhead flew over the trees and fired a solid slug into the Dakka-Fex, which combined with firepower from the Tau Battlesuit Command team finally finished off the brute. Once they were done, they then jumped over the woods behind the Hammerhead. The Genestealers leapt upon the Hammerhead and immediately 4 of the 8 were torn apart by the flechette dischargers. Unable to land a single blow, they were in trouble. The Tyranid warriors also charged in, but were only able to glance the vehicle, preventing it from firing next turn while losing one of their number to the flechette dischargers. The rest of the Tyranid swarm rushed forward as before with the big stompy Carnifex getting dangerously close to the Broadsides along with the 32 strong gaunt swarm. 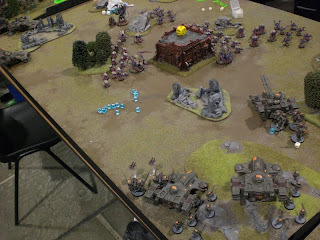 The Hive Tyrant and a nearby Genestealer swarm turned their attention to the two Tau tanks and Battlesuits peppering the back of the Tyranid army, inflicting a glancing hit on the Skyray which disabled one of its markerlights. In the Tau turn lots of Tyranids were killed. The Hammerhead flew away, the trio of Devilfish gunned down the remaining Genestealers and the Battlesuits blasted the Tyranid Warriors apart in a spectacular display of statistically accurate dice rolling. God bless Mathhammer when it actually works! The Broadsides were in trouble. They knew it. So they trudged towards the spinegaunts, killing 4 with their smart missile systems before wading into close combat. On the left flank the remaining 2 Tyranid warriors were killed and the very slow and ponderous Hive Tyrant ignored. On the right flank the Tyranids came to a halt due to their lack of synapse creatures, but not after the stompy Carnifex had killed the Broadsides in close combat and managed to catch a fleeing Devilfish transport and sent the Firewarrior team inside fleeing off the board. On the left flank the remaining Genestealers were wiped out and the Hive Tyrant ignored some more. Back on the right flank, the rest of the Tyranid army got mopped up in short order, leaving just a Carnifex and a Hive Tyrant at opposite ends of the board. 3 Kill Points to the Tyranids, 7 Kill Points to the Tau! For me, this game ran like text book for the Tau. But that was thanks to eliminating his high strength weapons early on. I was surprised that he didn't have any leaping Tyranid Warriors or more Outflanking Genestealers or this game could have been really tough for me. With my excellent win I was propelled up the tables to table 23, where I met Luke, a reader of Warhammer Tau and generally all round nice chap. His army wasn't so friendly though, as I soon found out. Fortunately I'd had my arse handed to me on a silver platter during Friday's games, so I had an idea of what to expect from a Valkyrie heavy Imperial Guard army. I'm a little hazy on Luke's army composition, but this was basically it. Against so many fast armour 12 vehicles all loaded up on heavy bolter, big explosion markers and lascannons I didn't fancy my chances. The fact that lots of little guys with melta guns would be jumping out of them made it even worse. Boy and to think I used to hate playing Ravenwing! This kind of army is the Tau's Nemesis because you can't outrun it, outshoot it or outfight it. So, knowing that I was pretty screwed, it was time to play tactically. Very tactically. Luke won the roll off and made me go first. Ah well, I suppose that gives me less to think about 'tactically'. The board was quite open, but for some trees around the middle, rocks at the side and one one side a large, square building. I chose the side with the large square building because I had an idea, then placed my Objective in the trees in the centre of my deployment zone. Luke placed his objective top right, where I'd struggle to get it if I set up in the centre, which is generally expected of most Tau players. Luke was fixated on my Broadsides. I knew that with his Outflanking Valkyries he could hit me from all sides, so it was wisest to hole up on one side, take the hits and see if I could go after his objective with faster units. Maybe I could hold him up long enough with all my sacrificial units to scrape a draw? I placed the Broadsides behind the building (which I knew he REALLY REALLY wanted to kill! ), a Skyray to the left and a Devilfish on top of the building itself. This left nowhere for his Valkyries to move on 12" and disembark their troops within range of the Broadsides. It would also give me a little bit of breathing space and stop his Valkyries from zooming into key positions. Meanwhile I placed the Battlesuits and Hammerhead in the centre on the objective to see if they could hold it until the bitter end while 2 Devilfish transports were held in reserve. I'm not going to do a turn by turn account of this game, because basically the plan worked...as well as it could. 4 Valkyries arrived on the right while the 3 Vendettas arrived on the left. I took the hits and lost one of the tanks, but in doing so Luke had exposed his troops who were now vulnerable to the burst cannons and smart missiles of the Devilfish which had arrived from reserve. Hosing down his troops the Tanks began to push forwards, towards his objective. This caused a momentary distraction for the Vendettas to stop blowing up the Hammerhead and killed my Battlesuits, but the Tau tanks were stopped dead in their tracks. 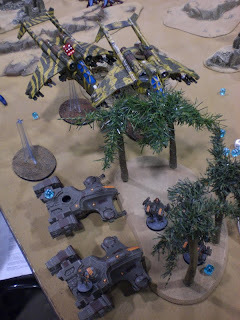 The Broadsides shot at the Vendettas all game, blowing off lascannons once in a while (rubbish!). He also disembarked another squad into the trees next to my objective. Perhaps I'm too much of a sport, because I pointed out that his unit was 1mm within 3" of my Objective and so they could contest it. Otherwise this would have been a quite stunning tactical draw for the Tau. Oh well. That's the way it goes sometimes. But then, I'd rather play properly and lose by the skin of my teeth than lie through my teeth to win a game. 1-0 on Objectives to the Imperial Guard. With that, it was down to my final game of the weekend. One look at this guy's army list and I knew what I didn't have a hope in hell of beating him. Hell, it was the last game of the last day. I was tired and I wanted to go home. But it's remarkable what a little luck can do for your game! Gareth's army was made up of numerous Space Marine chapters as a themed 'Crusade' army. But in truth I think he borrowed most of them to make a competitive tournament list with Shrike giving his terminators Fleet of Foot. So my final game would be my least favourite mission where I'd have to wrestle objectives from Armour 13 vehicles and 10 Terminators with 3+ invulnerable saves. At least it's Dawn of War - my favourite set up! I won the roll off, so I took the first turn, choosing the board edge with the least terrain so my tanks may cruise about without fear of crashing. We rolled for Objectives, getting 3. It's a really disgusting thing to do when you get 3, but I can place 2 Objectives in my zone while my opponent is stuck with just 1 to place in his. Harsh, but screw it, I've had it done to me. I placed the first Objective in the open, quite central. Gareth mimicked my placement, but put his Objective in some rocks. I placed the last Objective further left, also in the open. I figured that spreading out the objectives would be daft, because my army can't compete Unit to Unit, so a last term contesting rush might be in order. I set up nothing. He sets up nothing. All my Battlesuits are Deep Striking (I don't care, it's the last game and I'm gonna lose! ), he decides to Deep Strike Kayvaan Shrike and the Terminators as well. The game begins. From right to left it's Devilfish, Skyray, Devilfish, Devilfish, Hammerhead. The tank armada cruises on 6". No need to rush, no one is going to get a shot off during Turn 1 (which is something more people need to just accept about Turn 1 of Dawn of War). Gareth drives his tanks on to the right flank. Rhino with 10 space marines in on the far right, behind some woods, then 2 Vindicators, a Razorback with 5 space marine in behind his Objective, which is flanked by another Vindicator on the left. All tanks fire their smoke launchers. It's daylight and the Tau can fire! The Tau Battlesuit Command team arrives from reserve and Deepstrikes next the to Vindicator on the left, protecting the Razorback. Markerlights from the Skyray light it up, the Hammerhead locks on and fires its railgun, the Battlesuits use the markerlights to reduce its cover save and maximise their chances to hit and when the dust clears...the tank has been immobilised and lost its Demolisher cannon. I suppose that's something. Shrike and the Terminators don't arrive from reserve. In retaliation the Vindicator round the other side of the Razorback drives around and kills the entire Battlesuit Command Team in a single, well placed shot. On the right flank, the Rhino with 10 space marine inside continues its advance through the woods. 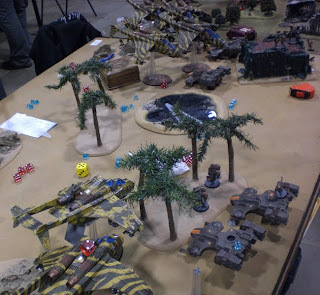 The Tau Battlesuit team with twin flamers and single missile pods Deep Strikes into the clearing between 2 Vindicators a Rhino and a Razorback on the top right of the table. They fire their missile pods into the rear armour of the Vindicator that killed the other Battlesuits, glancing it and preventing it from firing for the turn. Phew! 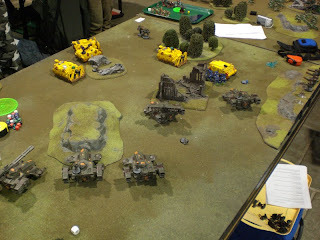 The Tau tanks advance, pouring fire into the Space Marine vehicles, but having no effect. The Broadsides fire at the Rhino driving through the woods, but only manage to blow off the storm bolter. Gareth rolls for his reserves. Shrike doesn't arrive, but the 10 Terminators armed with thunder hammer and storm shield do! He placed the sergeant in the clearing between the Broadsides and the Rhino in the woods. He rolls a 9" for the scatter and his enormous unit of 10 Terminators can't be placed without landing on the Rhino. He rolls on the Mishap Table and gets a 3. I get to place them wherever I like. Far left hand corner please! That should keep them out of the fight for the rest of the game. The Vindicator beside the Razorback can't do much, but turn to present its front armour to the Battlesuits. The Razorback takes a shot at the Battlesuits, but miraculously fails to wound one of them. The other Vindicator can't do anything either. That leaves the Rhino with 10 space marines which drives up to an objective and disembarks its troops who fire their melta gun at a nearby Devilfish, but only succeed in glancing it (due to range) and prevent it from moving or firing next turn. The Tau army descends on the 10 space marines, killing 6 of them with the 6 Firewarriors who disembarked from the stunned Devilfish causing most of the casualties. Meanwhile the 2 Battlesuits shoot the nearby stationary Vindicator in the back with their missile pods and charge in for the killing blow. The explosion inflicts a wound on one of them. In Gareth's turn, Shrike arrives from reserve and Deep Strikes behind the Hammerhead. I'd have said a little too close...but it's too late as Gareth scatters on to the back of the tank and rolls another 3 on the Mishap Table. Top left corner with the Terminators (who have been busy trudging forward all this time). The Space Marines fire at the disembarked Firewarriors, killing 4 of them, but the squad passes its morale check. The last active Vindicator kills the 2 Battlesuits with a well placed Demolisher cannon blast. The Tau army advances as one, gunning down the remaining space marines in a hail of smart missiles while the Firewarrior squad re-embarks into their Devilfish to go claim an ojective. The two other Devilfish do the same while the Hammerhead speeds forward, hoping to contest the Space Marine Objective. The Broadsides fire at the last Vindicator, but without any luck. The rest of the Tau army is content with its objectives. I Gareth's turn the Terminators use their Fleet of Foot (thanks to Shrike) to charge the Hammerhead and begin smashing it to bits. But they are only able to stun and immobilise the vehicle after tearing off its railgun. The game ends with 2 Objectives to the Tau and 0 to the Space Marines. I think we all know that I won this game purely due to Gareth's bad luck. But it was nice to have an easier game for once! Well, my army wasn't perfect, but I played well and there weren't any moments where I thought "Ah gawd, what did I do something stupid like that for!?" 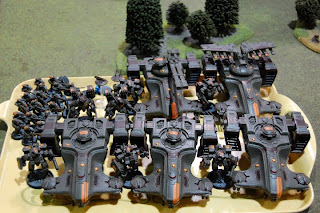 My Tau army faced overwhelming odds, unstoppable armies and fought many losing battles. But they emerged from the weekend with a grand total of 3 wins, 1 draw and 2 losses. I came 56th overall, just shy of qualifying and had I drawn with Luke I would have almost certainly have qualified for the final. If I had plenty of time, I'd definitely drop all the flechette dischargers from my tanks, upgrade my twin flamer and single missile pod battlesuits to twin linked missile pods and swap my Skyray for another Hammerhead or second team of Broadsides. But I've done well with what I have, played 6 very enjoyable games and confused the hell out of my opponents at the same time! What more could any Tau player ask for? Another fine read but this brings us to the end of the Grand Tourney and thus to the last stand of the Dark Green Tau. What is to become of Warhammer Tau until you start your new army? I think that this was your best Bat/rep of all! sounds like you had a great couple of challenging games on your second day. Luke's Imperial guard army seemed as though it was bigger than your army, points-wise for what he had! so now that the Tournement is over and the Tau are now under new management fighting else where, what will you be doing now? Great read. As a former Tau player it's great go see that the Tau can still hold up in the tourny environs! Thanks for posting! Great, congratulations! I hope that We can read something very soon about your new army! Hi guys, thanks for the kind feedback. As many of you know, I'm off to play Space Wolves for a bit. But the web's number 1 Tau blog will be back! So do not fret. I also have a couple of articles in the pipeline for Warhammer Tau as well as the latest Tau news. I think we will all happily be relieved!!! I don't know if the tournament scene has this officially errata'd, but the objectives for SG are (as the rulebook reads) placed before determining deployment zones. You can place two in a zone, hoping that you'll get that zone, but can't be sure of it, as the rules read. I've been converting my tau into mercs for a rogue trader guard army, this makes me a bit sad. Couldn't afford to buy up the Dfishes and extra hammerhead necessary to make it winning though...good to see the Tau can fight hard, though. I have just had a total F%&$ing disaster!!! (actually the tank commander from the devilfish)to test how well he actually performs; and after verbally abusing him so much here on the blog, turns out he is actually quite good especially with an honour-guard retinue (he didn't get killed either! Anyway, as we were clearing up our armies I went and did an "Adam-Blunder" 10-fold!!! I knocked the box my army was sat on and they fell. Devilfish main burstcannon is completely bent but the worst is that 5 of my crisis-suits and all 3 broadsides broke! And you all know exactly where!!! Don't know if I should just bin them all and get some new ones! I am actually feeling quite gutted at the moment! Any suggestions on how to stregthen the ankles on suits anybody??? Whenever I'm gluing crisis suits I always make sure to add some bulk to the base (pieces of sprue or other model bits) because the toes of the suits are so small. I just don't feel like it's enough gluing surface. This could probably be added to the ankle or body by putting some rocks underneath/around them and using an epoxy resin glue to bind them. Of course you'd make it clear to your opponent that it doesn't count as cover but that shouldn't be too much of an issue. Just an idea. I'll probably go for it with future suits, especially heavy broadsides. I was thinking of using sowing pins or something similar to push up through the base, foot and through the ankles to hold them firm but the ankle joints are just too damn thin! I hope, if GW release newer models of crisis suits, that they bare in mind taking into account how weak the ankles are and how strong "Gravity" has an effect on them. I only use flying stands. I know some people don't like them for LOS reasons, but when my suit took a spill two weeks ago the suit didn't break. Just an arm weapon came off, and that is way easy to glue back on. And they still hide just fine behind tanks on the flying stands. And people can't claim to see their ankles below the tank either. Granted my suits are all converted in some way to have more dynamic poses than the regular boring pose. Win win situation as I see it. Thanks guys, now I'm really paranoid about my crisis suits. My tau army is new so I haven't had to transport them to many games. Some custom foam trays might be in order methinks. Old Shatter Hands from the Tau of War suggested adding some greenstuff to bulk out the ankle sockets of broadsides. I suppose you could use epoxy resin glue as an alternative but it's a good idea to thicken and strengthen up the joint. some of my suit were on flying stands, which is why I want them all standing on bases; I don't think it matters about how you base them Flying/Standing..if they a bump, it's goodbye feet! Levi, I'm actually thinking of using my broken crisis as an objective diorama! I'm going to have them as a downed/dead crisis suits objective marker, maybe all of them placed into a plaster base with some other distinguished marker in the middle -dead Ethereal. Though it may turn out to be a 'BIG' objective marker, what with having 5 busted crisis suits! Pearlygates, I completely understand You, I wouldn't bin them either but I'm sure I'd try to reglue them. 6 FW + 1 devilfish at rapid range couldn't kill 1 (one) scout sergeant, who advanced on us next round, killing a FW, and in my next turn killing one more, making them run. A squad of 1 rune priest and 5 SM (rune priest and 2 SMs are in Terminator armour) came in on me with their drop pod, crew shaking and weapon destroying an Ionhead, killing a pathfinder and making my command squad all Wound 1. After this I fired at them with 3 plasmas on rapid range BS 4; 4 Missile pods BS 4, one twin-linked; 2 smart missile systems BS 4; and a devilfish BS 3. I killed one guy in space marine armour. Next round, this squad disabled my Devilfish (weapon destroyed, immobilized, crew shaken), same or worse with the ionhead, and killed my command squad (3 XV8s and a shield drone) and later my fire warriors from the DF. I know what you mean though.You throw the frickin' kitchen sink at something and it just doesn't die. Sometimes you just have to keep running and gunning. Screw the objectives and contest for the draw! In my last several games I've been playing with Tau I have been using Adams 'Tankwall'tactic. And though it keeps my crisis suits alive, I lost last night's game as it was capture and hold. - The wall is set up one side of the field with my broadsides on the opposite side, to ensure they have line of site. - The wall is reliable as a DEFENCIVE strategy, but I don't inflict enough casaulties to break the wall to be able to capture the other objectives, leaving the game usually as follows.. tau objective to me, enemy objective to enemy, 3rd objective either contested or falls to enemy. I feel that as the wall manouver is working so well, I become reluctant to break it up or push any other units forward. I tell myself to 'push on' and try to capture/contsest the objectives by turn 4 to 5 (turn 5 being a little too late really though) but I feel I havent done enough to break my opponent in order to make the move. Any advice you can offer would be greatly appreciated as has worked rather well! minus the loss of a couple D'fish but then that is expected. Please, please,please, PLEASE DO NOT ask me to look at your previous battle reports!!! I have tried filtering through them already and think I need a more direct and difine answer if you can offer one! your skills and insight will be much appreciated!!! Yeah, objective games are usually tough for the Tau. I think my GT game against the Nids shows a variation of how to do it which works relatively well for objective based games. You use a tank or two to protect your Battlesuits and other elements set up from the start (like Broadsides, Hammerhead, etc) while a slightly smaller force of reserves fly up the other flank. You need to plan your turns ahead otherwise your tanks get stranded because they're not fast enough. Usually you don't have enough to break your opponent. If things get desperate drive your tanks to contest the objectives and pray. There's not much else you can do. Thanks for the advice Adam, I will prob hold one D'fish in reserve, as I tended to field them all from the 1st turn which has proved to be my inevitable downfall, along with holding one Elite unit in reserve too! I'll let you know how it gets on. Lemme offtopic question please. Tell me, what kind and firm of those beautiful aqua dice you use? I bought them from eBay.